All your favourite Pictures, videos and games are rendered vivid and larger than life on the 4 inch Mobile (10.2 cms) qHD IPS display. Mobile With 3.2MP AF Rear Camera & .3MP Front camera capture best moments of your life. Freedom 251 with its inbuilt touchless technology is Ideal for perfect Selfie. For Selfie lovers life just got a little easier. Mobile With its 1450 mAh battery, Freedom 251 gives you more time to talk, text, Play and watch videos without needing to worry about running out of power. 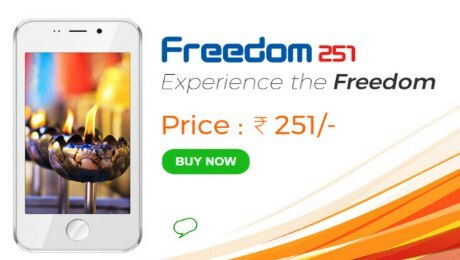 Tags-:Freedom 251 Smart Mobile Phone,Ringing Bells Freedom 251,Freedom 251 Mobile Phone Online Booking, India's Cheapest Smartphone,Freedom 251 is world's cheapest Android phone at Rs 251.,Android Mobile. Hits: 1175, Rating : ( 5 ) by 1 User(s).